"We had worked with several contractors and architects over a timespan of over two years to find the best solution to our somewhat intricate puzzle, but ultimately it was Krystle who was able to make key contributions that allowed us to move forward." -Dirk R.
This on-suite space was previously a 50/50 split of closet and bathroom, which meant everything in the bathroom was tiny. Additionally, the homeowners desperately wanted to incorporate a tub. To some people, it is more important to have a grand shower, some want an expansive double vanity with ample storage, but here, it was a soaking tub that we needed to fit into the space. 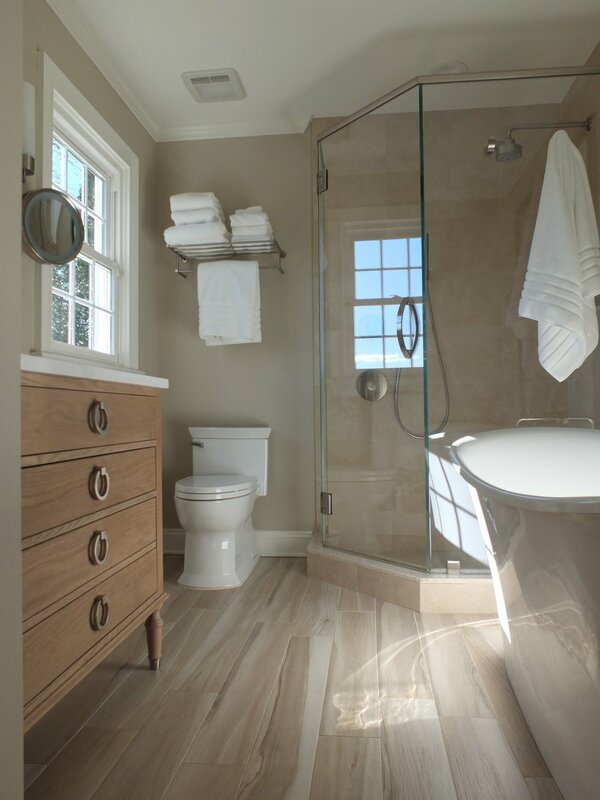 By reconfiguring the entrance wall to the bathroom and swapping the locations of a few things we were able to not only fit this great tub, but a shower you can move around in and still leave a closet space that is better organized and more functional remains.